Your weekly dose of information that keeps you up to date on the latest developments in the field of technology designed to assist people with disabilities and special needs. BELVA SMITH: Hello, I’m Belva Smith. I am the vision team lead and CATIS specialist at Easter Seals Crossroads, and this is your Assistive Technology Update. JOSH ANDERSON: Hello and welcome to your Assistive Technology Update, a weekly dose of information that keeps you up-to-date on the latest developments in the field of technology designed to assist individuals with disabilities and special needs. I’m your host, Josh Anderson, with the INDATA Project at Easter Seals Crossroads in beautiful Indianapolis, Indiana. 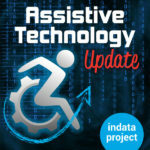 Welcome to episode 410 of Assistive Technology Update. It’s scheduled to be released on April 5, 2019. On today’s show, we are very excited to have our very own Belva Smith on to talk about the iCanConnect program. We also have Amy Fuchs on from BridgingApps with the Naprosyn mentioning. Take us away, Amy. AMY FUCHS: This is Amy Fuchs with BridgingApps, and this is an app with mentioning. This week’s featured app is called Airbnb. Airbnb is a travel app that allows users to find rental and vacation homes for more than 4 million homes and 191 countries around the world or to rent out their own home or space to others. Airbnb also allows users to search for restaurants and experiences. Airbnb recently made some exciting changes to its platform in order to make it easier for people with disabilities to find accommodations that suit their needs. The 21 new accessibility features Airbnb has added enable people to find homes and apartments that have stepped free entry to rooms, entryways wide enough to accommodate a wheelchair, elevators, roll in showers, pools with pool hoists, and more. Upon opening the app, users are able to search for a destination, homes, experiences, and restaurants. Once a location has been chosen, the user is then shown a description and details for the property, including number of guests it can sleep, bedrooms, bathrooms, beds, and amenities. Each location also includes reviews of users who have stayed there in the past, the house rules, availability calendar, and any additional fees. The user can also see photos of the interior and exterior of the property. The app makes it very simple to list your own property for others to rent if you like. Airbnb is an excellent app for anyone who is looking to book a trip and once an alternative to staying in a hotel. It can be very beneficial for anyone traveling with young kids, families, or anyone in their party that just requires a little more space. Airbnb is available for free at the iTunes and Google play store and is available with iOS and android devices. For more information on this app and others like it, visit BridgingApps.org. JOSH ANDERSON: Folks, our guest today needs no introduction, but I’ll go ahead and give her one anyway. Belva Smith is a CATIS certified assistive technology specialist, the leader of our vision and sensory team, a panelist on our sister show ATFAQ, a former guest on this show, expert on all things vision AT related, proud mother of two and grandmother of three, and an all-around awesome individual. But she also happens to be the contact person for the iCanConnect program here in Indiana and has been nice enough to come on the show and talk about the program with us. Welcome to the show. BELVA SMITH: Thanks, Josh. It’s my pleasure to be here in the studio with you this morning outside of our normal in-studio environment, and it’s always my pleasure to share information about the iCanConnect program. JOSH ANDERSON: When I realized that you hadn’t been on the show to talk about it, I was like, oh man, people need to know about this. I know it’s a really great program. We are really happy to be a part of it, and I know you get to work with some great people. Before we get started talking about the program, can you tell our listeners who don’t know you a little bit about your background? BELVA SMITH: I started out working with people who are using computers that were also visually impaired in about 2003. And then I was introduced to Easter Seals Crossroads and became an employee in the assistive technology department. I’ve been here ever since, love my job, and I get to meet some great people and always get to mess with some interesting technology. JOSH ANDERSON: It is nice, keeps it interesting, doesn’t it? JOSH ANDERSON: Before we get into iCanConnect, you are a CATIS certified specialist. Can you tell our listeners what the CATIS and what it means? BELVA SMITH: Yes. I’m also happy to share the information because I’m still going to consider it a new certification. Unlike you, Josh, you are a — what is your certification? BELVA SMITH: Yeah, and that certification has been around for many years. It’s a great certification for individuals that are in our role. Before the CATIS was developed, that was really the only certification available for people who do what we do. While that certification is great, it doesn’t have a lot of emphasis on folks who work with the visually impaired such as myself. Prior to this certification, I had certifications like a job as a certified trainer, ZoomText certified trainer, and that kind of thing. But the ACV REP developed the CATIS certification several years back. This focuses specifically on individuals who work with people with visual impairments. In fact, CATIS is the acronym for Certified Assistive Technology Instructional Specialist, and then for people with visual impairment. For those of you who may not know what the ACVREP is — that’s a long acronym. We’ll get out the vegetable soup – but that’s the Academy for Certification of Visual Rehabilitation and Educational Professionals. They have several different certifications for folks that are different things in the area of rehabilitation and education for folks who are visually impaired. I was very excited to become CATIS certified, and I will say that there are approximately, throughout the country, 100 of us now, but there are only two of us in the state of Indiana. There is still plenty of room for people who are interested in becoming certified. It’s just a matter of doing some studying and passing a test, and then you get your certification, and you keep it up with your continuing education credits throughout the you and do your renewal every two years. It’s a little bit different when it comes to the renewal from the ATP, but virtually the same idea. JOSH ANDERSON: We are very excited to have you on our team and had a certification as well. What we really have you on the show for is, what is the iCanConnect program? BELVA SMITH: ICanConnect, believe it or not, we are finishing up our seventh year. This is a program that is funded by the FCC. The idea behind the program is to get technology and training into the hands of individuals who have both a hearing and vision impairment. It has to be kind of significant, but it doesn’t mean that they have to be totally deaf or totally blind, and they also do have some income requirements that they have to meet. Those guidelines are all set by the FCC. The biggest challenge we’ve had since partnering – did I say that yet? We’ve partnered with Perkins School for the Blind. JOSH ANDERSON: You hadn’t said that yet. BELVA SMITH: We are partnered with Perkins School for the Blind to provide the services for the individuals here within the state of Indiana. Each state has a tier 1 service provider and then their local service provider. For us, that’s Perkins School for the Blind, and the idea is that we will meet with the individuals here in the state of Indiana and provide what we call an assessment to determine what type of equipment is going to be best for them and how much training they may need with that equipment. The whole goal – keeping in mind that the FCC is the one funding this — is for distance communication. What’s distance communication? That’s not face-to-face communication, but reaching out via email, FaceTime, texting, phone calling, that type of stuff. The types of equipment that we typically provide our landline phones, cell phones, computers, tablets, some Braille displays, things that are just necessary to be able to do a distance communication. Often – and I think that’s why I’m so excited that the FCC is funding this program – often times these individuals who are both hearing and vision impaired, they have no means of communication or reaching out to their family or friends. This has really just opened a great door for these individuals. I will say that one of the toughest challenges that we have experienced is getting the word out there. These folks often are not listening to podcast or radio or watching TV. Often, if they receive something in the mail, they may be don’t read it for how long because they are waiting for someone sighted to give them assistance with accessing that snail mail, is what I like to call it. Getting the word out to the individuals is what we found to be our toughest challenge. What we hope is that perhaps someone listening to this podcast this morning may know someone that would qualify, and they can then share that information about the program with them. Again, we are getting ready to wrap up our seventh year. The easiest way to find out more information about it, if you have access to the Internet, is to just go to iCanConnect.org. When you get to that website, you will find information about the program, and you can move down to your state to find out if you are eligible. You can even download the application from the website. Not everyone has access to the Internet, so if you happen to be a person who may be doesn’t have access to the Internet, another way that you can find out about it is to just reach out to us here at Easter Seals Crossroads. If you dial 317-466-1000 and ask for June White or Belva Smith, either one of us can give you information about the program and put the application in the mail to you so you don’t have to download it. We do have it in different formats, large print, standard print. We’ve never had one requested in a different language. But however we need it, we will get it to them. I wish I had a number for how many people we’ve been able to help over the last seven years I don’t have that exact number. What I can say – and this is one of the things I enjoy about it does we have provided assistance to individuals as young as 12 years old and as old as 93, 94 years old. It’s a large group of folks that we’ve been able to assist. My standard or typical day-to-day work, it’s typically someone who is either getting a job or keeping a job, or someone who is in college. It’s a different age group of folks. That’s always interesting to be able to help a different group of folks. I have several success stories couple one I always share, we had about five of us in the room with a middle-aged gentleman who had never used a computer at all, lived very secluded, by his choice, and you couldn’t even get high-speed Internet into his home, so we actually had to use dialup – that’s right, dial up still exists. Thank goodness, because not everybody does have access to high-speed Internet. Due to his geographic location, we just could not get high-speed Internet to him. When I first met with them, I left him with a keyboard, just a standard QWERTY keyboard, and said, “Play with this.” I just wanted him to get used to the way the keys felt and how his fingers were going to move around on it. He did that quite well. Fortunately he was a Braille reader, because this particular person has no vision at all and no hearing. Long story short, after lots and lots of practice and training, we were able to get him Internet access, set up with email, and he began sending and receiving email messages. His first email that he was able to read just brought tears to everybody’s eyes in the room. He’s been a consumer now for close to five years, maybe six. He was one of the very first ones we set up with equipment, and he reaches out daily via email. Every once in a blue moon, I’ll open up my email program and they will be a message saying, hey, it’s me, just wanted to let you know everything is working. That always makes a smile come to my face and gives me a little cackle, because it’s exciting to know that he is still out there and he still able to communicate. His favorite thing to do with his email is his sister, who lives about an hour and a half away from him, comes to see him biweekly to bring him groceries and things. Using his email, he is now able to make sure that she brings him all the appropriate things. Before because she would just show up and he would say, where is this or worse that, and she would be like okay, next time. Now he makes sure that she knows exactly what he needs and what he wants. He also is able to communicate with family members that live in different states, keep up on their health and the growth of their families and stuff like that. It’s just been an amazing tool for him. Another really good story that I like to share is about a young girl. I think she was 12 and in school, but having a difficult time because she wasn’t able to FaceTime an email with her friends. Believe it or not, at 12 years old, that’s kind of an important thing. She could communicate with her friends at school, but when she got home because she had no way of communicate with them. We were actually able to set her up with a computer, and she was able to then learn how to use Skype and email. It was amazing to see how excited she was to be able to do the things that all of her sighted friends were able to do. Most of us sighted folks take email and texting for granted, and sometimes even get frustrated because we get so many emails or text messages, but for those of us who have no other way to communicate, it’s just such a reward to be able to do that communication. JOSH ANDERSON: I know when I first started working with the team and everything, Belva let me go and work with some of these individuals. Like she said, most of the folks we work with are trying to get a job or are working and going to school. It’s great to be able to help them with those goals, but folks who haven’t been able to talk to their uncle that lives 20 miles away or talk to these family members, and suddenly they can communicate with them all the time, it’s amazing some of the joy you get to see. I remember someone I worked with, and him just giggling and so happy because he can sit there and send emails and read them. A lot of us don’t think – like you said, it’s not an indivisible group, but folks who don’t get out there a lot. They might have one family member that goes and takes care of them, like the one guy you were talking about. But being able to get this kind of program out to them is really important. We think working with vision folks, a lot of things are auditory. JAWS talks to you, your phone talks to you. That’s great, but if you can’t hear, that doesn’t help one bit. BELVA SMITH: That’s exactly right. I had one consumer, a lady who I’m going to say was middle aged. She once said to me after having her equipment and being able to use it again to communicate with her friends and family, she once said to me that before the program, she felt like she lived in a dark, quiet world. And through the equipment and the training, she felt the lights and heard the sound. BELVA SMITH: I know, right? It still touches me when I think of her saying that. Really, I did so little. It’s the individual that gets the equipment and the training that has all the hard work ahead of them. Because for a lot of these folks, they haven’t used technology. They don’t know the language, when you say a text or a message, they are like, what’s that? With a lot of them, you do have to start from the very beginning. With their practice and determination, they get to where they need to be — what’s the word I want to say? I don’t know. But they get to where they need to be to be able to do the staff independently. I said the biggest frustration is getting the word out, I would also say that the next biggest frustration – and we all deal with this – when technology fails as. BELVA SMITH: For example, if the Internet connection is down, they don’t know that. Oftentimes we know we are connected to the Internet because we can see lights flashing on our modem or our router. JOSH ANDERSON: Or there is a tiny icon up in the menu bar or somewhere else on the screen. JOSH ANDERSON: It doesn’t help. BELVA SMITH: And I’m hearing that that phone is supposed to be coming out with Braille support, which would be nice. JOSH ANDERSON: I did see at ATIA that they talk about it. They didn’t have one, but it’s something they are working on. BELVA SMITH: They have realized that there is a need for that. I will say to anyone who has a friend or family member who was both visually and hearing impaired, if they do not know Braille, encourage them to learn braille. That is probably at some point in their future going to be their only means of getting any kind of communication going back and forth, other than sign, of course. But braille is really important for folks that have both hearing and vision impairment. JOSH ANDERSON: You brought up a good thing with sign. I think we do have to give a shout out to the great interpreters we work with. JOSH ANDERSON: Especially deaf-blind interpreting. If you’ve never seen it, I think of someone knowing sign language – that’s a completely visual language. If you happen to be blind as well, they actually do the sign in the individuals hands who then signs back to them. It’s an amazing skill set, an amazing thing to see. It’s very cool. We get to work with some great interpreters who make the whole program possible. BELVA SMITH: We do. Josh, you’re right. They call it tactile signing. That tactile signing is very challenging. Typically, when we do an evaluation or training, there will be two interpreters, because they have to switch out regularly because it’s very demanding on them to be able to do that. I will tell you that when I first started working with these individuals, I would go home exhausted. Still to this day, if I have a challenging situation, it’s very challenging to have that communication have to go through myself, through the interpreter, to the individual. And I always have to make sure that I am understanding exactly what it is they’re trying to say. Oftentimes I have to repeat it, so the poor interpreter is doing it two times. JOSH ANDERSON: In training and things like that, “Press control ‘this’.” That’s not an easy thing to sign to someone and be able to show them. It is an absolutely awesome program. One more time, can you give us the ways folks can find out about the program? BELVA SMITH: Again, if you have access to the program, if you go to iCanConnect.org, that will pull up the global website. You can go down, there is a little menu bar on the right side of the page, and choose your state to get the application for the state of Indiana. If you drill down far enough, you will find my contact information since I am the contact person for the state of Indiana. If you don’t have Internet access, then you can always call us here at Easter Seals Crossroads, 317-466-1000, and ask for June White or myself, Belva Smith, and we can give you information that you need and send you out a printed copy of the application if you don’t have means of downloading it. JOSH ANDERSON: Perfect. We will put all the information in the show notes for folks so they can find it. If you do know someone who can benefit from this program or you can benefit from it yourself, definitely reach out. Like Belva said, you don’t have to have no usable vision and no usable hearing. There’s some thresholds there. You may qualify. It doesn’t hurt to apply. BELVA SMITH: Right. As I did mention, there is some income guidelines that have to be followed. On that website, you can find out. I apologize, I don’t know what they are. They change frequently. But don’t “not” apply because you think income might disqualify you. If you are both hearing and vision impaired, go ahead and get the application and apply. In the entire time that we’ve been doing this, there’s only been one person who himself withdrew his application because he felt like he made too much money. There’s been no one that the program has turned down. That’s important to know. Don’t be afraid of having to provide income information. JOSH ANDERSON: Definitely don’t be afraid of the technology. It’s not just recommendations for that and everything else. It does come with the training as well. I can tell you, Belva is an extremely patient individual, and I’m sure the folks who work in the other states are as well. BELVA SMITH: And the continued support. It’s almost like once you become a user or a recipient of the iCanConnect program, we are here to support you until the program goes away, and we hope it never does. In the beginning, it was a large to just see if this is something we really need. It’s been determined that yes, we do. As long as the FCC can continue to fund it, I don’t see it every going away. JOSH ANDERSON: We definitely hope that doesn’t. Belva, thank you so much for being on the show today. BELVA SMITH: Thank you, Josh. My pleasure. JOSH ANDERSON: Excellent. We will have you on some time to talk about the other great things you do. BRIAN ANDERSON: Do you have a question about assistive technology? Do you have a suggestion for someone we should interview on Assistive Technology Update? If you do, call our listener line at 317-721-7124, shoot us a note on Twitter @INDATAProject, or check us out on Facebook. Are you looking for a transcript or show notes? Head on over to our website at www.EasterSealsTech.com. Assistive Technology Update is a proud member of the Accessibility Channel. For more shows like this, plus so much more, head over to AccessibilityChannel.com. The opinions expressed by our guests are their own and may or may not reflect those of the INDATA Project, Easter Seals Crossroads, or any of our supporting partners. That was your Assistance Technology Update. I’m Josh Anderson with the INDATA Project at Easter Seals Crossroads in Indiana. Thank you for listening, and we’ll see you next time.